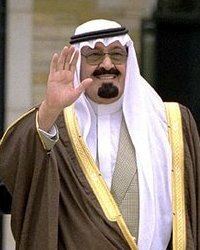 KING ABDULLAH (translation): Because we refuse to marginalize the role of women in every aspect of Saudi society within Sharia boundaries, and along with consultations with our clerics in the association of senior clerics and others outside it, all welcomed this direction and supported it. So we have decided the following. I nearly fell off my seat when hearing the King’s speech. My aunt and cousins were watching it live and the reaction they said was amazing! He starting from the top! Not with little things and small victories. He gave us a say. Finally! This was the only part of the 22 page speech he had prepared that he read setting the tone for the new year! Congratulations to all Saudi women (even the ones who are trying to rain on the parade!) stop nitpicking and start working on your campaigns if you really want to change things! We are going to be part of the decision-making process and have a platform to be heard from. (not that we were ever quiet to begin with but now we can be vocal in an official capacity). It makes me laugh to think that if the King had said “all women can drive” there would have been a bigger reaction internally and globally when potentially this new decision can solve so many more problems that women face here, and that are more important than just driving. Women can now look into implementing the rights that are given to them by Islam and fight for the legislation to enforce them. We can fight for our rights in divorce and custody issues and child welfare. We can fight for more independence in issues that concern us such as not having to get permission to open bank accounts for our children. This is so much bigger than driving a car! Driving will come eventually when the people themselves stop opposing it. It’s a social taboo, no more no less. I am swelling with pride and anticipation (and the ridiculous amount of pasta I had for lunch). Next If You Can’t Beat Them, Trick Them! What is going to happen in 2015? That when the next term starts, so therefore when woman can run for s place in the shoura council and the municipsality counsil and can vote. Should have been clearer. Why can’t I see this as a step forward?, I mean it’s just more of the same, except this time we’ll see women be part of this paralyzed council.Plus ,even the elected memebers of the municipality councils have no role to play in the decison-making process! Qusai, you can look at this is two ways; You can think ‘nothing has changed, everything is the same’ and stick to the attitude of if I don’t get it all then I don’t want anything at all. Or you can be of the thinking that changes have been happening even if they are not at a fast past but they are surely happening. Who says it ends here? with this? This did not happen on a whim. Women have worked for this. Written petitions to the king, proved themselves in the private sector and where they have a role in the government sector. They have been working so hard for this over the years and now something amazing has come of it. You can look at it as nothing or you can see that this is a start. A stepping stone. It’s your choice how you want to perceive it. I personally know some of the women who have spoken out and I have seen how they have been heard in the small matters and now in this! We Saudi women know how to take what we have and work with it, make it grow and prosper and in the end, get what we have worked for. I’m sorry if I came across like I was trying to paint a gloomy picture of progress on women’s rights.Sure, it’s painfully slow ,and that’s why I think more bold steps need to be taken to push for faster progress.But I still maintain that allowing women to serve as appointed memebers of the shoura council or run for municipal council would make no difference when it comes to the decision-making process.They should’ve allowed them to drive instead!